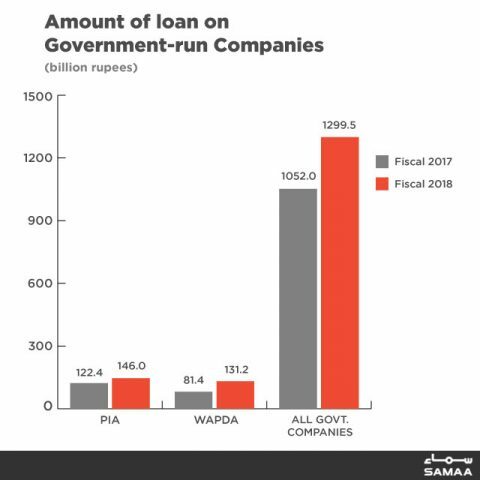 State-owned enterprises, Pakistan International Airlines and the Water and Power Development Authority, ate up Rs277 billion of taxpayers’ money in fiscal year 2018, statistics from the State Bank of Pakistan show. When converted in dollars, the money that keeps PIA and Wapda afloat equals the amount needed to plug the $2.2 billion monthly trade deficit (where imports cost more dollars than exports could earn). Collectively, these SoEs consumed Rs1.3 trillion of taxpayer money as their total debt and liabilities rose 23.5% last year. There are about 200 public sector companies and an overwhelming majority of them are in a loss because of mismanagement, operational inefficiencies, ailing infrastructure and political interventions. These SoEs, particularly the white elephants PIA, Wapda and Pakistan Steel Mills, are a major drain on our economy. However, successive governments have failed to reform them, let alone turn them into profitable entities. For example, the $6.4 billion IMF bailout package the PML-N government had availed in 2013 was, among other things, subject to restructuring and privatization of these loss-making SoEs. Five years later, Pakistan is in need of another IMF package because it needs to increase its dollar reserves to pay for essential imports such as oil and repay its foreign debt. Islamabad’s quota at the IMF is around $6.5 billion while the dollar equivalent of debt and liabilities by these SoEs is $10.4 billion. This is more than half of the annual trade deficit, which stands at $18 billion.